The Youth Blood Drive is in full swing following the launch of the program only on World Blood Donor Day, June 14 2016. The Founder and Director of the program Anna Megueria was pleased to provide us an update on current happenings for the program. 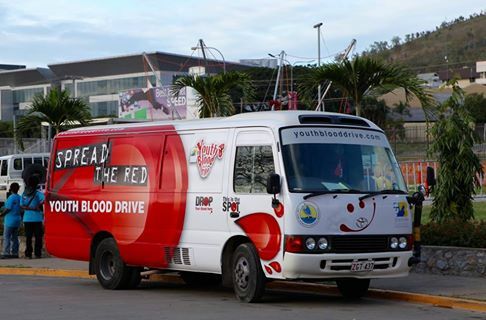 “The Youth Blood Drive Program is continuing to gain momentum and we are really engaging with the youth of PNG. This program had a 12 month build up, and importantly we had to find the right partner to make this all possible. We found the perfect partner in the Sir Brian Bell Foundation, where the CEO Mrs. Bronwyn Wright had the foresight to see the positive outcomes this program will make. We recently attended the International Youth Day and Walk For Life event at Sir John Guise Stadium on Sunday, 21st August. It was another great success with over 65 bags of blood collected, with another 50 plus people that wanted to donate, however, following initial screening they were unable to donate at this time. I think the greatest part of our program is the education values. Even though these people could not donate, they were provided the reasons why and how to fix this. Donating Blood starts with having a healthy lifestyle and diet. We educated people both pre and post donation, and then go a step further once the blood has been tested. Previously our donors had no idea if their blood was clear from infection. Our blood donors can now visit the PMGH blood bank after donation and receive their results which gives donors and opportunity to seek medical advice if there is an issue. Our goal with the Youth Blood Drive is to make donating fun, and the recent event on World Youth Day was an excellent environment for this. We had over 500 inquiries about donating and people wanting to learn more. We provided hats and shirts for those that donated, plus a badge of honor in the form of a sticker confirming they had just donated. It’s all about education, and realizing that the simple act of donating can have a profound effect on people’s lives that are receiving this blood. You really are saving lives by donating. The World Youth Day arranged and coordinated by World Health Organisation, was the first time to occur in PNG. It was attended by approx. 5,000 people throughout the day, with more than 40 organisation’s attending. The Youth Blood Drive will attend next year, as they know this event will only go from strength to strength.